Up to 2 days before serving, triple wash, air dry, and trim the stems off of the parsley and mint. You can air dry the parsley uncovered in the fridge for an hour or two; just don’t forget about it because it will dry out in there (who knew?). Once it’s dry, if you’re not going to serve it today, place the herbs into a big Ziplock to maintain freshness until you’re ready to finish the tabbouleh. Between 1-6 hours before serving, in a small container, combine lemon juice with bulgur, red & black pepper, and salt. Cover and store in the fridge until just before serving. After step 2 and before things get too crazy in the kitchen, mince the onions, mint & parsley. Now, the best wives will shun the food processor in this step, but I won’t tell if you won’t. I’ve even used scissors to speed this step up. If you use the food processor, start with the onions, then add the mint and parsley. Warning: the food processor will increase the sogginess and decrease the texture of the tabbouleh, so be advised if you choose this route. Or you could do it the old-fashioned way and chop chop chop to your hearts' content. Right before serving, generously douse the parsley with olive oil. Chop and add the tomatoes. Pour (or dump) the bulgur dressing over all and combine.Garnish with hearts of Romaine lettuce and serve right away. Kitchen Kibitzing: Back in Burbank, CA, we lived about 30 yards away from a fantastic little Middle Eastern/Armenian produce co-op where we got 6 bunches of parsley or two bunches of mint for one measly dollar. Imagine! I loved that such cheap and fresh ingredients were so readily available while I was in the learning stages of the terrific new recipes that make my husband feel at home and adored. His face lights up like Dodger Stadium when he finds this on the table. I love that I can put a smile on his face and inspire him to brag on me so easily, too. Tabbouleh has a reputation for being labor-intensive, but I’ve included some planning steps that should break it down into manageable chunks. As always, modify everything to your family’s tastes & schedules. 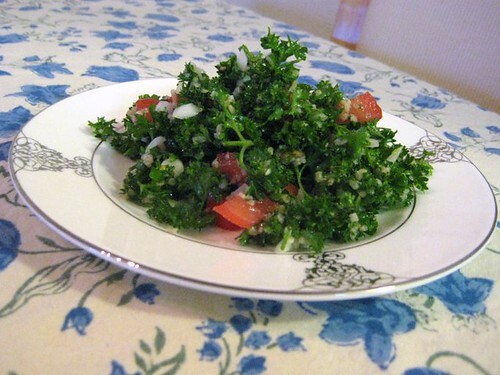 Just remember, one never knows where an evening that begins with tabbouleh will end up!